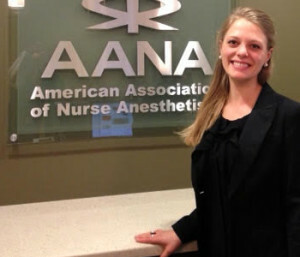 As a first year nurse anesthesia student, I have been encouraged to attend AANA meetings and despite my interest, I had not been able to go to the annual and mid-year meetings which require traveling and numerous expenses. I expressed interest in attending this year’s Mid-Year Assembly and the VTANA excitedly offered to support my trip to the nation’s capital. I had no idea what an inspirational and educational experience I was going to have. Throughout the extended weekend, I attended various lectures and educational sessions preparing me to speak with our Vermont legislators regarding current issues in healthcare and anesthesia. This year, as a group, the AANA focused on promoting access to healthcare for Veterans. I had the privilege of meeting with two of Senator Sanders’ staff members to discuss current bills that directly affect our patients and their access to anesthesia services. In addition to the education I received and the experiences I had with legislators, the opportunities to network with CRNAs across New England were numerous. Whether it be a dinner with CRNAs excited to promote our profession and support student involvement in the AANA, or during a quick break between presentations, I connected with my future colleagues, each of whom had wonderful advice and encouraging words to share. I send a heart-felt ‘thank you’ to the VTANA for their support of student nurse anesthetists!